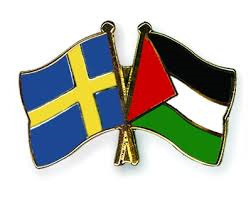 Sweden will join more than 130 other countries that recognize a Palestinian state. This article includes a nice succinct summary of the related historical context for Sweden's decision. Noted. Thanks for sharing Sam. It's good news-I only wish the U.S. govt would stop supporting Israel on this issue. Then the siege would be lifted and the people of Palestine would have a chance to start improving their lives after all the damage done to them by Israel. Israel must lift the blockade and allow the Gazans to build the ports and airports they need to rebuild their country. The article says 130 countries recognize the existence of Palestine, but that's not enough to help the people there when the U.S.and Israel stick together. It takes more than words...The govt's in the countries that recognize Palestine need to pressure the U.S. to end the support for Israel's atrocities. Then things might actually change for the Palestinian people. The rest of the world needs to hold Israel accountable for its war crimes against the people of Gaza and the West bank. At the same time these countries need to hold America responsible for funding the crimes! I have no problem with the U.S. supporting Israel. What I DO have a problem with is that our "support" = providing Israel with arms to commit genocide. This is NOT "Assistance!" It is ENABLING for the sole reason of profit. The U.S. must demand that the Occupation STOP. The U.S. must demand that the torture and imprisonment of children STOP. The U.S. must demand that Palestinians be provided with Due Process. The U.S. must demand that Israel vigorously prevent settlers and other Jewish Extremists from committing violence and murder on Palestinians. In order for this to happen, the Global Community must take action to ensure that the U.S. starts adhering to International Law. I would like to see the U.N. declare all countries who's monies are used in the assistance of Genocide be labelled "Rogue." I am TIRED of my tax dollars paying for crime! Noted. Thanks, Sam. Agree with Linda and Marc; the Palestinian people deserve much better! The US needs to stop enabling Israel's continued war on Gaza and the West Bank, and both the US and Israel need to be held accountable for all the death and destruction they've caused. Noted....Linda and Marc have hit the nail on the head so to speak! Noted. Thanks, Sam. Cogent comments here - thanks Linda and Marc! Wonder if we can pressure our lawmakers enough??? Whether it is going to be a two-state solution, a one-state solution or something entirely different altogether, doesn't really matter and I think the Swedes are well aware of that. The point is they recognize the Palestinians as a people, and as a people who are entitled to their own state and have to be respected in any negotiation as such by Israel. The Swedes want to send both the Israeli and the Palestinians a signal that they should work on a solution as equal partners. WHY in HELL didn't Israel just sit there and let itself get bombed out and the jews would have been exteriminated. and would have made many people happy. After all Palestine is our friend --- they celebrated on the anniversary of 911 ----- and Israel has ONLY exported more lifesaving medical technology to the far-flung corners of the earth than any nation of comparable size. It has done more to protect the environment, to promote literature, music, the arts and sciences, to spread agricultural advances and to fight terrorism within the rule of law. It's time for the U.S. to follow suit. Palestine deserves its freedom from Israeli terrorism. We condemn all other terrorist acts ~ why not Israel? Thanks Sam. Good for Sweden! If enough other countries follow suit, let us hope this will force Israel to stop its atrocities againist the Palestinians. and what exactly does that accomplish? cause i'm at a loss here yo. how in the world can those 130 countries lose sight of the fact that a few million jordanian expatriate's occupying jewish land does not make them a nation. especially when they are surrounded by one of the most powerful armies ever that not one of those 130 countries is ever gonna do anything about. so what exactly do the swedes accomplish? with the exception of being so generous with jewish lands, what did they accomplish? i'm still at a loss here yo, cause from where i'm sitting two state is dead. Thx Sam, I too cheer Sweden, good on them and happy for the Swedish to finally have a more decent new government! As for US correcting their act, it's been said over and again and you know I agree with those comments above. BUT DONT TELL SAM and us, friends,TELL YOUR GOVT THAT! I for one just again today responded to some emails, including that of Nancy Pelosi, to tell her to CUT THE INSANELY GENEROUS MILITARY AID TO ISRAEL! I have sent that type of response to nearly all the emails that have been raining in on a daily basis for weeks, asking for my contribution as the dems are sweating for their Senate in primaries,-and rightly so! already signed from email, thx for posting the link here Evelyn. 9. Okt. 2014 � On Monday morning, 13th October, MPs will get the chance for the first time in years to debate and vote to recognise Palestine as a state. MPs to vote on Monday to recognise Palestine: please make sure your MP is there to vote! If you haven’t already contacted your MP, please do so viahttp://act.palestinecampaign.org/lobby/Palestine. The debate and voting is ongoing right now, no results as of yet. But with a large number abstaining the outcome is quite open.